It's kind of hard to compare Mac OS X Lion to Windows 8, mainly because, well, while we now know a fair amount about Lion, we essentially know only two things about Windows 8: that it exists and that it has a tablet-friendly overlay as its main interface. But what I think we can say is that they're two very different approaches to bringing tablet-like features to PC operating systems. Both Apple and Microsoft seem to be trying to bring the PC and the tablet closer together. Apple's stated as much in its "Back to the Mac" event late last year--that they were taking some of the features and concepts from the iPad and folding them back into Mac OS X. With Windows 8, Microsoft is trying something similar--yet completely unlike what Apple's attempting. In a recent post, John Gruber states the following: "What Microsoft revealed this week is that they do not believe there is a post-PC era. They’re banking that the PC era will never end". I think Gruber is onto something: Apple seems to see tablets as something completely new, as a clean break from the past. Meanwhile, Microsoft seems to perceive tablets as a continuation of the PC, not a replacement for it. And this difference in philosophy shows in Windows 8 and Lion. The goal with Windows 8 seems to be to build an OS that can play nice with everything. 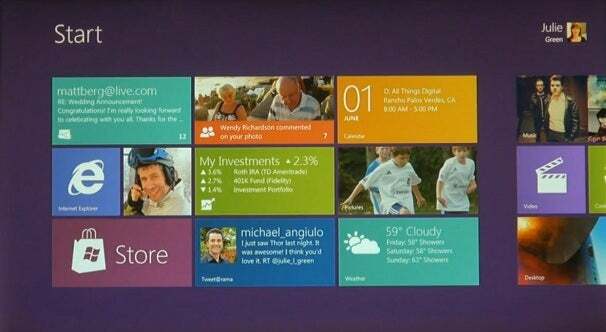 Windows 8 will be designed to run on tablets...and traditional desktops, laptops, and all-in-one touchscreen PCs. It's meant to be a one-stop-shop of an OS that can cover all your bases. There are advantages to this approach: You don't have to learn a new OS if you jump from a laptop to a tablet, for example, and your software will work on both devices. But while having one OS for PCs and tablets is a nice idea in theory, it's hard to say if Microsoft will be able to pull it off. Using a touchscreen to interact with an app is a totally different experience from using a keyboard and mouse. Some things that work well on a touchscreen don't work well on a traditional PC, and vice-versa. And while tablets and PCs do most of the same sort of things, there are certain tasks that tablets excel at, and other tasks that PCs excel at. And I think history has shown that taking apps designed for keyboards and mice and cramming them onto a tablet just doesn't work. So while there's a lot to like about where Windows 8 is going, we'll have to wait and see how it all plays out (you know, like when we actually find out more about how it'll work). Instead of taking a one-size-fits-all approach to its operating systems, Apple is retaining the division between tablets (with iOS) and PCs (with Mac OS X), but back-porting some tablet-like features to OS X. This approach seems more reasonable to me--after all, a touch-based interface is going to be different from a mouse-based one, as I said above. Just the same, how well it works remains to be seen. Will the iPad-like features added to Lion improve using Mac OS X as a mouse-driven OS? Or will the additions feel forced, and be a poor fit? Trying to strike the right balance is going to be key for Microsoft and Apple. For now we can only speculate, but we'll soon know which company has the better approach.